The ear is a sophisticated organ that transmits the sounds we hear into electrical impulses that are interpreted by the brain. The process of hearing and interpreting sound is accomplished at a fantastic speed. To achieve this remarkable feat, each part of the ear - outer, middle and inner ear - fulfills a specific function. The outer ear is composed of the pinna, or (auricle), the familiar visible portion of the ear, and the ear canal. The pinna, with its grooves and ridges, provides a natural volume boost for sounds in the 2000 to 3000 Hz frequency range, where we perceive many consonant sounds of speech. The shape of the outer ear serves to give preference to sounds originating from the front. The middle ear consists of the eardrum, or tympanic membrane, and three tiny ear bones, or ossicles. The ossicles are the smallest bones in the human body. Although named the malleus, incus and stapes, they are often referred to as the hammer, anvil and stirrup because of their characteristic shape. The ossicles take mechanical vibrations received at the tympanic membrane into the inner ear. Besides their role in the transmission of sound, these bones help to protect the ear from damage by constricting and limiting sound transmission when sound is too loud. 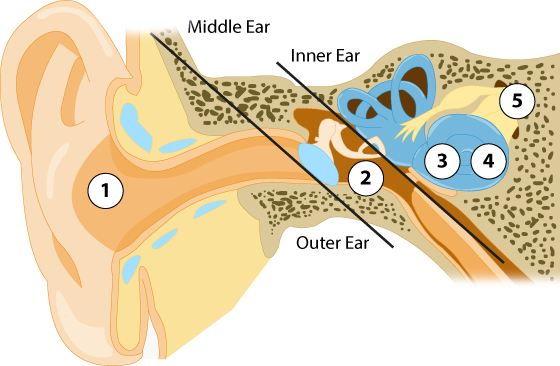 The middle ear also contains the Eustachian tube, which connects with the throat, and serves to ventilate and regulate pressure in the middle ear. The middle ear is encased in bone and does not associate with outside air except through the Eustachian tube. This tubular structure is normally closed, but it can be involuntarily opened by swallowing, yawning, or chewing. It can also be intentionally opened to equalize pressure in the ears, such as when flying in an airplane. When this happens, you might hear a soft popping sound.